The massive amounts of English required for grad school are slowly wearing down my Japanese ability, but I’ve found a couple of conversation partners (one who just returned to New Orleans) and I still get translation work every now and then (and some of those times I can actually fit it in my schedule). I recently did a little work for a company, and just this past Monday a check finally came through for some work I did over the summer. Both of these events reminded me of a critical translation/project management vocab word – 請求書 (せいきゅうしょ). First I’ll address this from a translator’s perspective. Most companies want invoices by the end of the month, so you can save it until then or you can submit the invoice along with the finished translation. I always take the latter course so I don’t forget. If you get a lot of work from a company, then you can save all your invoices and send them together at the end of the month. Companies may charge a transfer fee of $10 or so, and if you are a yen pincher, then you could try and combine several months’ worth of invoices into a single month. Be careful, though – some companies ask that invoices be submitted within a certain amount of time after the translation is completed. You want to make sure you have all your bank info on the invoice along with contact info and the job number (if you were given one). As a translator, you should expect to get paid a month or two after you submit your invoice. If you finish your work early in the month, then you may end up waiting as many as three months. As a project manager, when you receive an invoice, the first thing you should do is print it out. At least that’s how we handled it where I worked. Whether or not you print it may be up to the company policy, but you should immediately take the first step toward processing the invoice. Forgetting to file a translator’s invoice properly is one of the most embarrassing things you can do – trust me. Translators help you look good (or at least try to help you look good), and it pays to take care of them. Once I printed and filed the invoice, I always confirmed this fact with the translator so they could have peace of mind. A couple of updates to old posts. If I added them to the actual posts at this point, no one would notice, so I thought I’d make a separate post. In the comments Arline reminded me of one of the commands that can be used to count characters in Microsoft Excel and Open Office. “=len(target cell)” will count all of the characters in the target cell. Note that this is all the characters regardless of line breaks. If you’re working with material that has line breaks within cells, then the easiest way might be to open up a separate file, do the translation line by line counting the characters with =len, and then pasting the final result back into the cells of the original file. Check out the final Collabo-Ramen video! Did you notice the way that Komuro-san was answering my questions? For each of the two questions I included in the video, she begins her response with そうですね. Note the tone that she uses – this is exactly what I was referring to in the Japan Times article. Using this そうですね when responding to questions will make your Japanese sound much more natural. Since I wrote this post about Murakami’s/Murakami’s publisher’s Internetal ineptitude, I noticed that my Facebook profile was devoid of Murakami. That’s strange, I thought, I could’ve sworn I had him as one of the two authors I like under the “Books” section of my profile. (The other being Barbara Tuchman. “The Zimmerman Telegram” was a weird combination of all my interests/ethnicities – intrigue between U.S., Mexico, Japan and Germany. My father’s family is Mexican-American, and my father’s mother’s family were Germans who immigrated to Mexico.) I searched for Murakami on Facebook, and sure enough, the unofficial page had been deleted. There is now an official page run by Knopf, AND it’s being updated frequently. This has all happened in the past week and a half, however, so we’ll have to wait and see if it gets properly maintained or ignored like the Random House site. Translation isn’t only about content: often presentation is just as important. 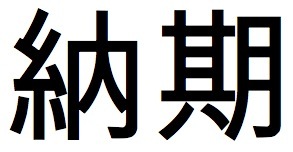 One of the most important aspects of presentation is 改行 (かいぎょう) – line breaks. There are two reasons for this. The first is that a lot of Japanese content comes formatted with line breaks after every sentence. This formatting is especially prevalent in Powerpoint presentations. You should always format the paragraph yourself when translating or editing a translation. Otherwise you’ll end up with text that is shaped very strangely. This is an exaggeration, of course. But in Japanese, this doesn’t look as strange. Part of it is because Japanese sentences are so long. And the other part is that it’s much more standard to add line breaks manually in Japanese. Check out an email from a Japanese person. I think most Japanese people rarely make it to the end of a line without a manual line break. Do your best to format the text into coherent paragraphs. Often the Japanese will have an extra line break between sections, which should give you a hint at appropriate paragraphing. The other important aspect of line breaking has less to do with presentation and more to do with programming. Because video game text has to fit on a screen, generally there is a cap on the number of characters per line: a “character limit” – 文字制限 (もじせいげん). I don’t know much about the specifics of how this works, to be honest, other than that translators and project managers have to abide by the character limits provided by game companies. Some companies have automatic solutions, but others still input the line breaks manually. Depending on which version of Microsoft Excel you have, you can also use macros to count the number of characters. I’m not very good with coding and the macro I was taught at work doesn’t appear to work on Open Office nor on Office Mac 2008 (my current platforms), so I won’t pass it on for fear of passing out poor info. Anyone know any cool macros to count characters? In my office, there are Japanese coordinators that receive translation requests directly from the client and then prepare estimates for the projects. In order to complete the estimate, they have to provide a 納期. That’s where I come in. I take a look at the volume of the project and give the Japanese coordinator the 納期 – the number of business days it will take to complete a project. This includes the time it will take the translator to translate the material and the time it will take me to check and revise the translated text. I use the numbers discussed previously to come up with an estimated number of business days. The beautiful thing about 営業日 (えいぎょうび) is that they don’t include the weekend. Holy is the project that spans the weekend, for it giveth the translator extra days to work and therefore extra days to revise the document which in turn ensureth a more accurate and pleasant-reading translation. When I get asked, 納期は？ I usually answer with something like, 4、5営業日 depending on the volume. The client will take a look at the estimate the Japanese coordinator submits and then give the official go if everything is in order, at which point we determine the specific delivery date based on the 納期 we provided.